(originally posted at thedarkstuff.com) In the past, I've never been a huge supporter of artists (or artists' families) posthumously releasing music that the artist him or herself did not agree to release. Take Jimi Hendrix, for example. Since his death, a number of unreleased tracks have been released. Nothing wrong there, per se; but the folks who handle Jimi's estate have also had partially finished studio tracks "fixed" through use of technology not available in the 60s and by having current musicians record missing parts. It's a travesty, if you ask me. But, lately, we have seen a number of "stripped down" versions of classic albums being released. These releases showcase the raw tracks and take out some of the (often) excessive production utilized at the time. The Beatles excellent Let It Be...Naked is a great example of this. Whether or not John Lennon would have approved of this release if he were alive is debatable; but the newer version really shows what The Beatles sounded like "raw." It's quite good. Late last year, Capitol Records began re-releasing much of John Lennon's post-Beatles material. Besides re-mastering the albums, they were essentially left intact...with one exception. 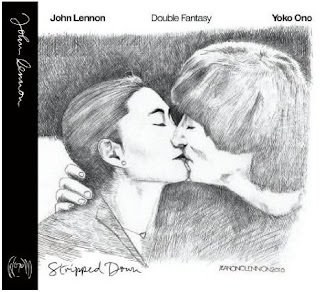 Lennon's final proper album before his murder, Double Fantasy, has been released in a new version. Double Fantasy Stripped Down does for that album what Let It Be...Naked did for Let It Be. Listening to the album in headphones feels like you are sitting in the room with Lennon has he serenades you. It is really eerie at times. Not being much of a fan of Yoko Ono, I generally skip over her songs. Hearing these more intimate mixes of Lennon singing songs like "Watching the Wheels," "Woman," or "(Just Like) Starting Over" makes me re-love these songs as if they were new. It is such a strong testament to the man's enormous talent. If you already have the original, I strongly recommend picking up the new version. If, for some reason, you haven't heard the original, start there. But once you love the record, pick up the "stripped down" version and see if it doesn't enhance the experience.